FQB "Sunshine Cottage" Collection bursts with beauty in this summery kit!! 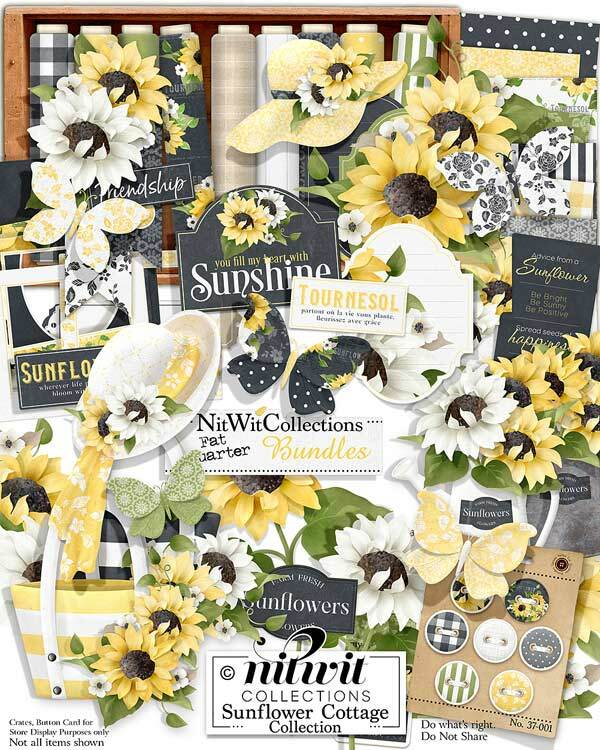 The striking contrast of the white, black and yellow in this digital kit will bring a smile to your face and evoke the feelings of that perfect summer's day. The gorgeous sunflowers bring such life to your layouts, mini albums and card making ideas, and to pair these with a sun hat or watering can will give you the ideal start for your creation. Now add in a journal card or label and you are well on your way to finishing your creation and enjoying its splendour! Capture that feeling of the sun on your face and the succulent blooms of summer....ahhh can you feel it?? 1 Cluster of the sunflowers and butterfly with a "Friendship" tag attached....who would be the perfect person to honour?? 5 Journal labels that let you personalize any layout or card with. Diarize your thoughts and feelings....it's worth it! 1 Label - "You Fill My Heart With Sunshine"
1 Label - "Farm Fresh Sunflowers"
1 Label - "Sunflower...wherever life plants you...."